Your daily scoop of what State of the Union is watching today, July 18, 2014. 1. Malaysia Airlines plane crash. President Obama confirmed that a surface-to-air missile shot down Flight 17 in a territory controlled by pro-Russian rebels. But he stopped short of blaming a particular culprit. "There's been a lot of misinformation generated in eastern Ukraine generally," Obama said. "This should snap everybody's heads to attention and make sure that we don't have time for propaganda, we don't have time for games and everybody needs to make sure we're holding accountable those who committed this outrage." The President also called for an immediate ceasefire between Ukraine and the rebels so an international investigation can proceed without any tampering of evidence. NATO's Supreme Allied Commander of Europe Gen. Phillip Breedlove, who is leading much of the U.S. military's technical intelligence gathering on the crash, joins State of the Union this Sunday. 2. Russia's role. 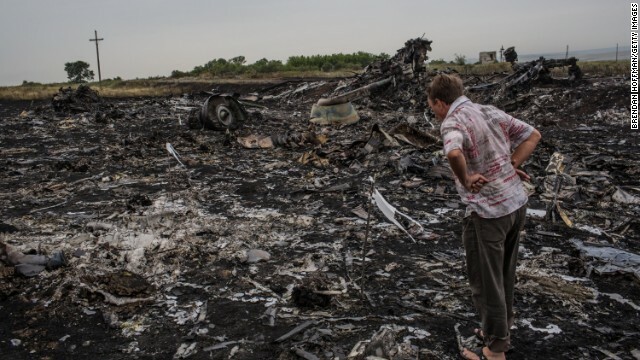 Russian Foreign Minister Sergey Lavrov said Moscow would "insist on the most objective, most open and independent investigation" into what happened to MH17. "With regard to the claims raised by Kiev, that it was almost us who did it, in fact I haven't heard any truthful statements from Kiev over the past few months," Lavrov said an interview with Russian state television. Meanwhile at an emergency meeting of the U.N. Security Council, U.S. ambassador Samantha Power said if pro-Russian rebels are responsible for shooting down the plane, investigators can't rule out the possibility that Russia offered to help operate the missile system. 3. The passengers and crew. Of the 298 people aboard, all 15 crew members were from Malaysia. 189 of the plane's passengers were from the Netherlands. The rest were from Malaysia, Australia, Indonesia, Great Britain, Germany, Belgium, the Philippines, Canada and New Zealand. One passenger identified as Quinn Lucas Schansman, had duel U.S.-Netherlands citizenship. Nearly 100 AIDS experts and advocates were also on the downed plane. 4. Israel's Gaza ground invasion. Palestinian security officials say Israeli troops and tanks have reached the center of the territory since launching its ground operation Thursday. Israel says its main targets are tunnels Hamas uses to sneak into Israel and smuggle weapons. According to Palestinian health officials 271 people have been killed in Gaza since the escalation of the conflict between Hamas and Israel. Israel says Hamas has fired more than 1,000 rockets from Gaza into Israel.